Spring framework provides an easy way to manage the dependency. It can be easily integrated with struts 2 framework. The ContextLoaderListener class is used to communicate spring application with struts 2. It must be specified in the web.xml file. Create struts2 application and add spring jar files. In web.xml file, define ContextLoaderListener class. In struts.xml file, define bean name for the action class. In applicationContext.xml file, create the bean. Its class name should be action class name e.g. 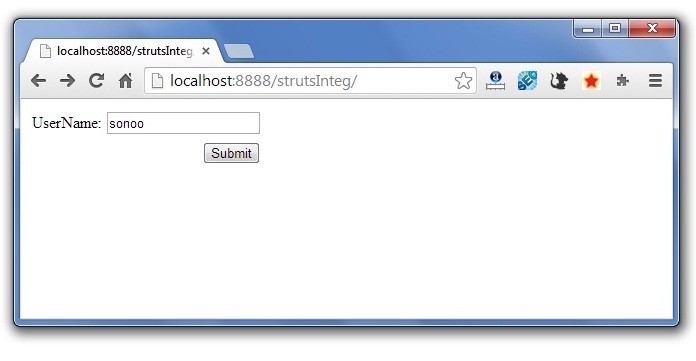 com.javatpoint.Login and id should match with the action class of struts.xml file (e.g. login). In the action class, define extra property e.g. message. This page gets the name from the user. It defines a bean with id login. This beans corresponds to the mypack.Login class. It will be considered as the action class here. It should be located inside the WEB-INF directory. It defines two property userName and message with execute method where success is returned.